In a fast-paced and action-packed narrative, Navy SEAL commander Rorke Denver tackles the questions that have emerged about America's past decade at war—from what makes a hero to why we fight and what it does to us. Heroes are not always the guys who jump on grenades. Sometimes, they are the snipers who decide to hold their fire, the wounded operators who find fresh ways to contribute, or the wives who keep the families together back home. Even a SEAL commander—especially a SEAL commander—knows that. But what's a hero, really? What do we have a right to expect from our heroes? How should we hold them accountable? Amid all the loose talk of heroes, these questions are seldom asked. As a SEAL commander, Rorke Denver is uniquely qualified to answer questions about what makes a hero or a leader, why men kill, how best to serve your country, how battlefield experiences can elevate us, and most importantly, why we fight and what it does for and to us. 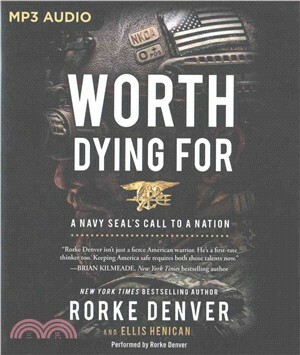 In Worth Dying For, Denver tackles many of these issues by sharing his personal experiences from the forefront of war today. Denver applies some of his SEAL-sense to nine big-picture, news-driven questions of war and peace, in a way that appeals to all sides of the public conversation. By broadening the issues, sharing his insights, and achieving what civilian political leaders have been utterly unable to, Denver eloquently shares answers to America's most burning questions about war, heroism, and what it all means for America's future.